Last month we examined a “blueprint for buying behavior” and detailed the six stages of change through which buyers progress. This issue describes some of the methods that assist individuals in making the transition from one stage to the next. The methods are explained, and illuminated through life science examples. Part 1 of 2. Providing support that is appropriate to the individual’s stage can increase the number of individuals who eventually end up ready to take action – that is, to buy. The model states that if you want to affect people’s purchasing behavior, you must identify the stage of change that they currently occupy, and provide the support appropriate to their needs at that stage. Providing support that is appropriate to the prospect’s stage of change can assist them in moving from one stage to the next. This is important, because individuals can remain at some stages (in particular, Stage 2, Contemplation) almost indefinitely. Providing support that is appropriate to the individual’s stage can increase the number of individuals who eventually end up ready to take action – that is, to buy. The model not only identifies the stages of change, but also the different processes that can be used to facilitate change. Each process (which I will call a method) is most effective when employed during particular stages; not all methods work at each stage. The relationship between the methods and the stages is shown in the following figure. Figure 1: The relationships between the six stages of change and the methods of change that can be used to assist individuals in moving from one stage to the next. Before looking at each of these methods in detail, let me point out that there are few – if any – techniques that will ‘force’ people to buy from you. And no technique that I’m aware of will force people to buy while maintaining their good will in the long term. The goal of sales and marketing is not to encourage people to buy something they don’t need, but to help them identify their needs and then find and purchase the best solution to those needs. Given that understanding of the marketing and sales process, let’s review the various methods of helping prospects make the transition from one stage to the next. The goal of sales and marketing is not to encourage people to buy something they don’t need, but to help them identify their needs and then find and purchase the best solution to those needs. Helping people make the transition from Stage 1 to Stage 2 is a tricky challenge, because Stage 1 often manifests itself in denial: “I don’t have a problem, so I certainly don’t need your solution!” Most of your sales and marketing efforts will focus on prospects in Stages 2, 3 and 4, as these are people who do recognize that they have unmet needs. Since some of the methods to help people make the transition out of Stage 1 also work during some other stages, we will cover them here. When making the transition from Stage 1 to Stage 2, two of the methods are most effective: Consciousness-raising and Social liberation. Consciousness-raising is providing information to a buyer to enable him to see his issues in a new light. After all, to have a need fulfilled, one must first become aware that a need exists. Many people in Stage 1 Precontemplation lack the information to perceive their needs clearly. There are many techniques to help raise prospects’ awareness, but these must be carefully applied, as all too often supplying information will be viewed as being ‘pushy’ and self-serving. To counter this natural suspicion, supplying unbiased information is a powerful method of consciousness-raising. For example, a review from an independent source comparing the speed and features the major protein synthesizers in the market could be effective in pointing out to a buyer that better solutions (faster speeds, higher throughput, better features) are available. The key here is that the information must be unbiased, otherwise it will be seen as self-serving. One effective tactic is adding a ‘share this’ button to your web site. This allows other people to forward information (that you have developed) to your prospects. Because it is recommended by another source, the information is viewed with less suspicion. Social liberation is the effect that others’ behavior can have on an individual; it involves the recognition of alternatives while offering support for individuals who might be considering changing their behavior. This might take many forms, including peer influence or legislation, among others. The tendency to see an action as more appropriate when others are doing it normally works quite well. From the prospect’s perspective, social liberation tends to appear neutral and unbiased, in that it is not the recommendation of a single person with unknown motivations (e.g., a salesperson), but the evidence of collective action by many individuals. This neutrality can be particularly valuable with prospects in Stage 1 Precontemplation. In many life science sectors KOLs (key opinion leaders) are a prime example of social liberation. Thought leaders or people in positions of prominence, such as recognized and respected physicians, are recruited to speak about their experience with specific solutions and treatments. This implicit endorsement can encourage people to consider something they might not otherwise consider. Legislation can be another factor of social liberation. For example, all clinical trial data used to be supplied to the FDA on paper. At some point, electronic submission was declared to be acceptable, though optional. This declaration was a powerful factor of social liberation for early stage buyers considering the purchase of electronic data capture/reporting systems. The fact that the FDA would accept data in a new format went a long way towards legitimizing this choice. When making the transition from Stage 2 to Stage 3, the two methods we have already discussed, Consciousness-raising and Social liberation are augmented by two others, Emotional arousal, and Self-reevaluation. At Stage 2 Contemplation, buyers are seeking information. They have acknowledged that a problem exists, but they have not yet formed a commitment to take action by a defined date. Individuals can remain in Stage 2 Contemplation for years. 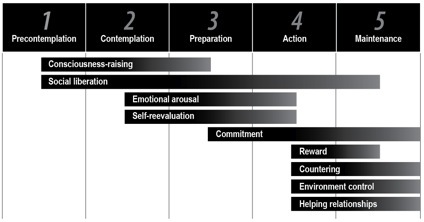 The difference between buyers in Stages 2 and 3 is that those in Stage 2 are simply aware that they have a problem, while those in Stage 3 also have an intent to act within some reasonable timeframe and therefore are forming goals and making plans. This leap is a significant one, and the methods that can assist buyers in making this transition are powerful. Emotional arousal is the use of emotions to stimulate awareness, interest and, ultimately, behavior change. Emotions are powerful motivators. They can stimulate individuals as they move through several stages in the buying cycle. Remember that early-stage buyers (buyers in Stages 1 and 2) need inspiration? Emotions can certainly drive inspiration; all you have to do is listen to a good political speaker (on either side of the aisle) to hear how emotions can assist in making a point. Emotional arousal can take a negative slant as well as a positive one. The classic sales strategy of focusing on the buyer’s “points of pain” can bring emotions to the fore while highlighting dissatisfaction with the status quo and encouraging the consideration of alternatives. Even though scientists may deem emotions less important than rationality in the decision-making process, emotions do still play a role. Self-reevaluation is the process by which individuals compare their current situation with an imagined future and weigh the pros and cons of the purchase in question. Self-reevaluation is the process by which individuals compare their current situation with an imagined future and weigh the pros and cons of the purchase in question. Often this evaluation involves a critical view of the present – focusing on the cons of the current situation – and an optimistic view of the future, imagining the future once the purchase has been completed. It can follow naturally from consciousness raising. Self-reevaluation is also known as “envisioning” as people imagine details of the future. Imagery can play a key role, so photographs, videos, floor plans and other graphics can be effective tools that support envisioning. Early-stage (Stage 1 and Stage 2) buyers need inspiration. Envisioning a future filled with benefits can be very inspirational. Late-stage (Stage 3 and Stage 4) buyers need reassurance. Focusing on the negatives of the present situation while envisioning the “how” of a solution’s implementation can be very reassuring; the right choice is being made and the transition will not be too painful. One of the most useful techniques at this stage is a detailed pro/con list; many scientists and technically trained buyers respond well to these. Without knowing the current situation for your customers, it is difficult to put a customized ‘con’ list on your web site, for example, but providing a compelling list of ‘pros’ should be easy to do. There are many other tactics that can support self-reevaluation. A worksheet with some blank spaces and some information already filled in can invite comparisons between a new offering and the prospect’s current solution. By entering their own data into the worksheet, buyers are encouraged to compare the present with the future. In this issue, we have covered the first four methods of facilitating change: consciousness-raising, social liberation, emotional arousal and self-reevaluation. We will cover the remaining five methods in the next issue. If you want to affect people’s purchasing behavior, you must identify the stage of change that they currently occupy, and provide the support appropriate to their needs at that stage. The transtheoretical model outlines the six stages that buyers go through as they progress through the buying cycle. The model states that if you want to affect people’s purchasing behavior, you must identify the stage of change that they currently occupy, and provide the support appropriate to their needs at that stage. Providing this support can increase the number of individuals who eventually end up ready to take action – that is, to buy. The model outlines the different methods that can be used to assist individuals as they progress through the steps in the buying process, and we have covered some of these methods in this issue. In the next issue, we’ll cover the remaining methods. [i] The Transtheoretical Model of change was first proposed by J. Prochaska. It is described in numerous places, including Prochaska, James O., PhD, et al., Changing for Good (New York, William Morrow, 1994). This model for change was brought to our attention by Blair Enns of Ennmark Performance.